Spam has always been a big problem for all blogs. Fortunately, worpress.com provides wonderfull Akismet spam filter which is works amazingly well. I do have switched on moderation for all comments, to make sure no spam gets through, but without Akismet it would be impossible to manage it because of the spam volume. 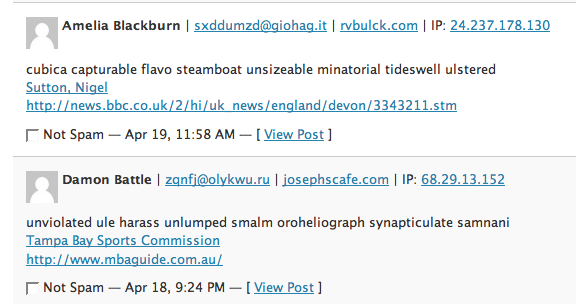 Since I started this blog (August 2006), it caught over 17’000 (yes, seventeen thousands) spam posts. In other words, about 30 spam comments a day or almost 60 spam comments per published post. Next boundary is of course 128K, 256K, 512K hits and finally a “Megahit”. But that’s far far away. One model for popular writing is that it panders to the reader’s prejudices. Plain and simple. People like writing that validates them and especially their ideas. He certainly does validate mine, which is the reason why I made it blog of the day :-). Find for yourself. It is all about deep questions and problems computer science. Including the question whether such thing as computer science actually exists. I thing it does, but have occasional moments of doubts – mostly when I read something related to real science :-). His comments are amazingly deep for such a young guy. I wish when I was getting my comp-sci degree (1981-1986) we have had the same wonderful things these young fellas have now: ubiquitous internet and really world wide web with Google that actually makes it useful, Linux and many other wonderful open source projects (Apache, Jakarta, Firefox, Eclipse – you name it). Can you imagine studying computer science in a world where the Web does not exist (yet) ?